This is one of those questions that makes non-swimmers look at you kinda funny. How can you have a fast pool or a slow pool. It’s water. And the formula for that has been known for a while. H2O. But as any swimmer can tell you, there are definitely fast pools, and definitely slow pools. So what makes them that way? Swimmers will come up with more reasons that you can imagine, and I have to admit that some of them are pretty creative. But let’s stick with more conventional thinking. There are 4 main factors that affect the swimming speed of a pool: turbulence (surface waves), pool depth, water circulation, and starting blocks. This is the big one – the major factor that affects speed, and the major factor that has impacted on pool design over the years. If you’ve ever swum in the ocean, you know what swimming in waves can be like. Although pool waves aren’t as high, we do create our own waves as we swim. After all, we’re basically shoving water out of way so we can get down the pool. And those waves will slow a swimmer down when they hit them. Turbulence comes in 2 forms: Direct, and Reflected. Direct turbulence is basically swimmer to swimmer. Without lane ropes separating swimmers, the pool would become one big choppy mess, slowing everyone down. So besides separating the swimmers, the lanes ropes are there to absorb the waves that swimmers create. They’ve improved tremendously over the years. I remember swimming in meets years ago where the lane ropes were just ropes with a little donut-shaped plastic piece every metre or so. These days all big meets will use the best ones available to absorb the turbulence. 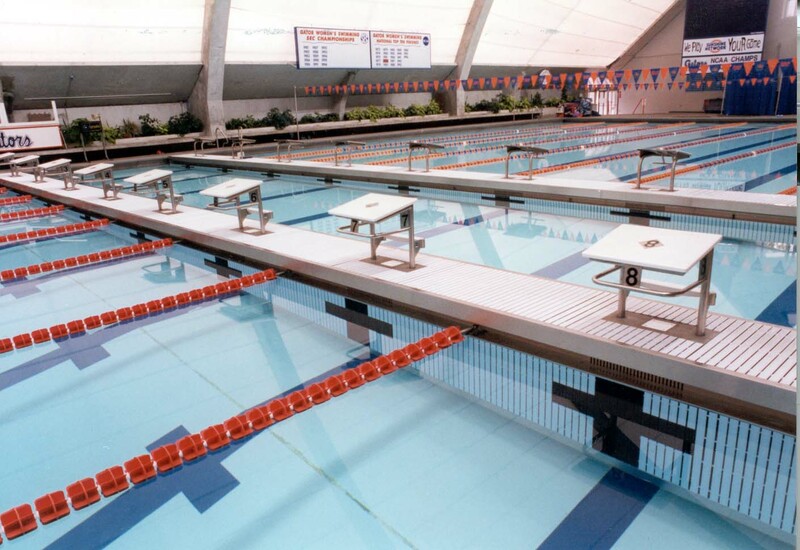 But in many smaller meets, the pools may be using older, less-effective designs. That makes a big difference. Reflected turbulence comes when waves bounce off the side or end walls and comes back at a swimmer. And its usually the same swimmer that created the waves in the first place. Handling these waves actually has taken a lot more pool design and technology than any other factor. On the sides of the pool, level gutters can take good care of surface waves. But two other methods are often used to handle side reflections as well. 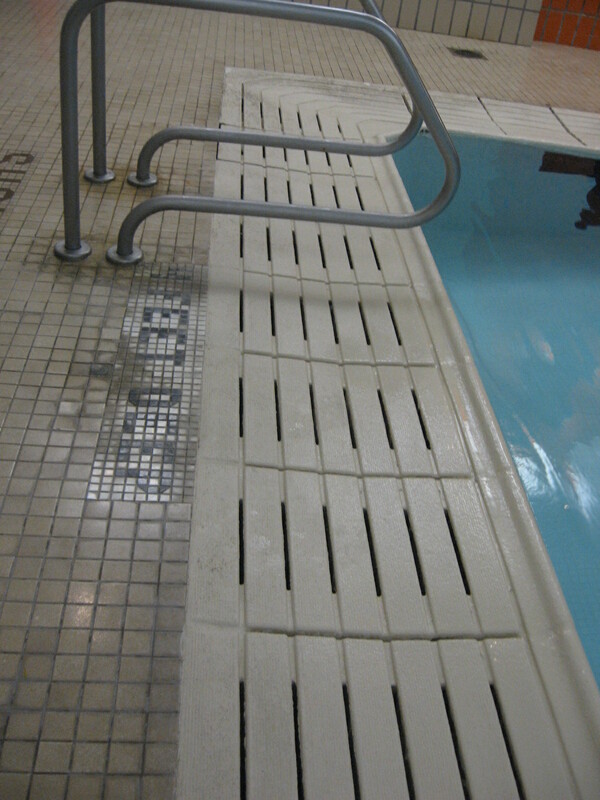 Additional lane ropes can be put right by the walls on the sides of newer pools in order to cut down on waves before they even reach the wall. Big international meets even call for two additional lanes (from 8 to 10) with nobody in the outside lanes. This minimizes the impact of side reflections on all swimmers in the water. The major problem here is that 10-lane pools cost a lot more than 8-lane pools. A lot more. End-reflected waves are much harder to control. Level gutters are less desirable as swimmers like to have a visual indicator of the end wall, timers need some place dry to stand, and starting blocks need to go somewhere. The Milton Sports Centre shows the newest thinking in having level end gutters inset into the wall, with the wall continuing above the gutters. Another problem with end walls are that the solid walls will very effectively reflect waves back out. Concrete walls are very bad that way, but bulkheads can be built with many holes that can help absorb part of that incoming wave. That is, unless they have a touch pad on the wall. In other words, end-reflected waves are a problem for most pools, and really good solutions have yet to be found. Pool depth affects speed in pretty much the same way that turbulence does, except these waves are underwater. As the swimmers moves through the water, they send out waves in pretty much every direction, including down. These waves fan out and lose strength the farther they travel. If the pool is shallow enough, the waves will bounce off the bottom and come back and hit the swimmers relatively hard. The deeper the pool, the weaker these waves will be when they get back to the surface. But there’s another way that the pool bottom can affect speed. The transition from the deep end to the shallow end can be handled in many ways in a pool, and in most designs, waves will bounce off that transition right back at the swimmer. 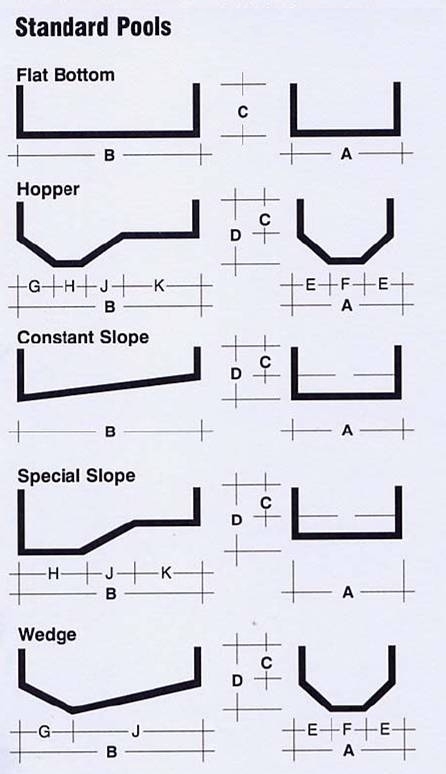 The best transition appears to be a gentle slope. The worst is usually a large step. Those ubiquitous water jets are in every pool, and they have to go someplace. Often right at the ends of the pool. As swimmers come into the wall, the jets push them back, sometimes very energetically. And while the jets will help the swimmer when they push off the wall, they are going much quicker so the jets are of very little benefit. To make things worse, the jets aren’t placed in each lane, so some lanes will be more affected than others. 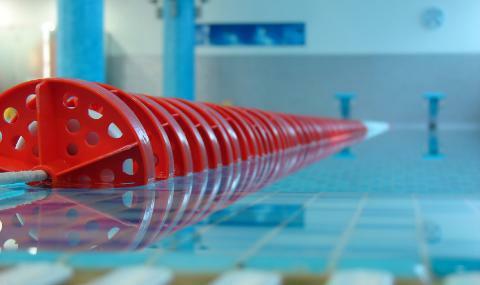 Even jets placed on the sides of the pool can make a big difference if you swim in an outside lane. Our Drury pool is a good example of that. Swimming against the wall is actually difficult since the jets want to push you out. The newest technology being used at big competition pools are up-flow jets evenly spaced on the bottom of the pool so that they don’t impact any one lane more than another. Starting blocks have evolved tremendously over the years. Milton is a perfect example. The old Drury pool has starting blocks that are level, slippery and incredibly high above the water. You cannot get a good start on those no matter what you do. The next pool built in Milton was the Leisure Centre. These blocks are slanted, a good height, but the surface material is still a little on the slippery side. 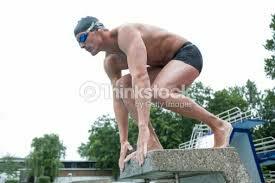 You can still get good practice in starts, but they will be a little inconsistent. The newest pool is the Milton Sports Centre. Only a few years old, these blocks are slanted, have the new movable wedge, and a surface on which it is impossible to slip. There is no question that the fastest starts can be done at this pool. Those 4 factors make the biggest difference in swimming speed. But there are a few other factors that can possibly, maybe, conceivably impact on performance. Wall slipperiness – The Etobicoke Olympium had notoriously slippery touch pads. 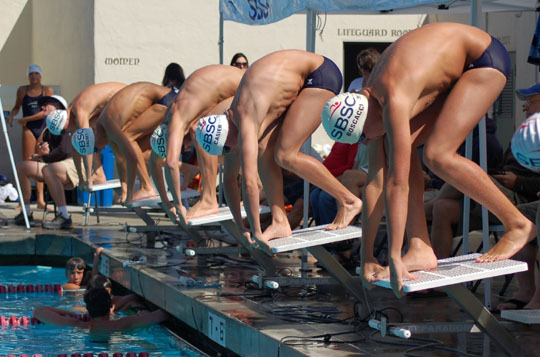 It was not uncommon to see backstrokers slip off the wall at the start, or see horribly slow turns for the same reason. Even world champions have slipped on walls during major competitions. 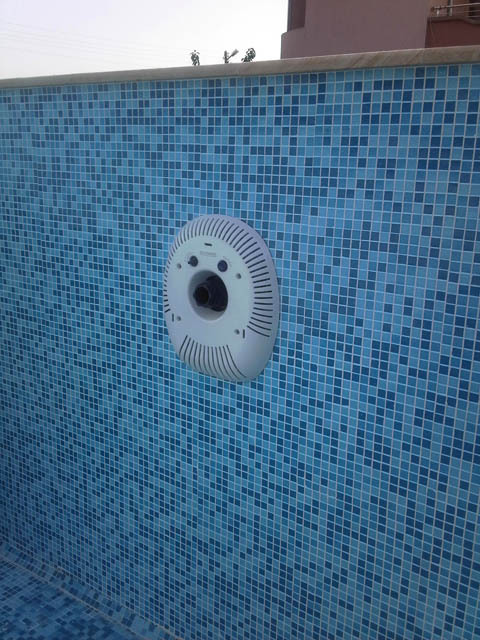 Air Quality – This seems like a strange one, but if you’ve ever spent 4-7 days at a pool with horrible air quality (e.g. Nepean Kanata pool) you’d understand. Bad air can affect breathing, induce coughing, and leave you with headaches. Definitely not a good environment for swimming fast. Water Treatment – Now we’re pushing it a little. There are some who insist that chlorination through salt creates more dissolved solids in the water, which makes the water more dense. As a result, slower swimming. And others insist that the additional salt creates buoyancy that raises the body, reduces water resistance. Meaning faster swimming. The reality seems to be that there is very little difference. Bright Sun – Whether swimming outdoors, or swimming inside with large windows, a bright sun shining in your eyes when you’re swimming backstroke can be a problem. Some swimmers claim that wall light brightness, lane widths, familiarity with the pool, elevation above sea level, number of screaming fans and a host of other things affect swimming speed. The bottom line is that if they firmly believe this, they may end up making it true. Previous Post What Does it Mean to Be On a Swim Team? Very interesting, hope elements like these were examined during the design of the pool for Rio. One proven example regarding a fast pool is definitely the Tualitin Hills Aquatic Centre, the destination for the Thunderbolt Junior International every December (formerly Paul Bergen). Every year you’ll see Canadians going heading down there and crushing their PBs/smashing age group records (2013; Evan White 200Br, 200Fl, 100 Fl. 2012; Breanne Siwicki 400 IM. 2011; Russell Wood 100 Bk, Kierra Smith 200 Br). Whatever they did with the design of that pool could definitely serve as a model. I’ve heard so much about the Paul Bergen pool and the incredible times that consistently come out of there. But I haven’t heard much about the pool design. I’ve also heard the rumours about that pool that pop up about any fast pool – that its ever so slightly short. Not enough to be obvious, but enough to make a difference. I always ignore those short-pool rumours. If there is one thing we know how to do reliably, its measure distance. Instead, I suspect it’s a fast pool that’s used for major meets when people rest or taper, and it attracts fast swimmers that push others to go fast. That’s the perfect formula for a meet. I’ve reblogged this article because the speed of the pool is something we discuss at the ends of the pool from time to time. Ah, I thought there was something about the shallow end that slowed me down! Really interesting stuff, thanks for posting. My DD loves swimming. She has won several medals in school for swimming. We have created a special pool in our home with the help of well known swimming pool builder (Solda pools) in Toronto . She practices daily 2 hours in that pool. Now we are thinking of getting her a better coach for swimming. Thanks for your comment. If you think DD is ready to get more serious about swimming, I suggest you contact your closest or most convenient competitive swim club affiliated with Swim Ontario. They will have trained coaches who can help DD improve. I visited your website earlier today and just wanted to congratulate you on a well presented, and informative website. I have an (Aussie) website that has relevant information to your site, I am wondering if you would be interested in exchanging links allowing both of us to add significant and related resources that will be useful to our readers. I would be interested to hear anything you can propose as well; such as guest post articles, product or business reviews, promoting up and coming events or promotions to each other’s databases etc. Hope your all well.. It’s my 2nd time emailing you and I would like to make a follow up in regards with my last email. Hope you could reply soon. Another very useful post. Swimming may be my savior through running injuries. One real recuperation mistake for newbees like me would be to eat too much within the days after the actual race. gracias por su publicación. Saludos. Very informative post. Keep sharing! Great information. Very useful information. Looking forward to more helpful information.